If you are wondering how those storyboards fit in with Prophecy, there was a mistake with the WCP press kit and some of the movie storyboards were thrown in instead. On the whole movies based on computer games have never worked out well. One of the big problems is that there is no reason why a good game has to work in another format – attempting to convert something like Super Mario into a film just doesn’t make any sense. A lot of other titles like Tomb Raider were games that ripped off films in the first place so by the time the film was made it was hardly going to be original. My hopes were higher with Wing Commander. 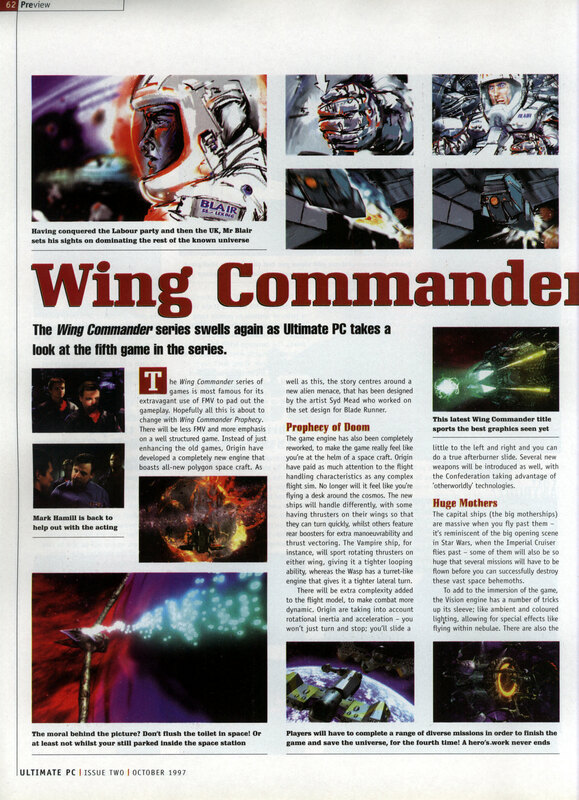 Here we were talking about a series of games that had always played like movies anyway and with Wing Commander 3 and 4 were as much movie as game. Not only this but Chris Roberts who had brought us the series in the first place and proved he knew where to point a camera in Wing Commander would be directing it. What could possibly go wrong? Lets find out….. 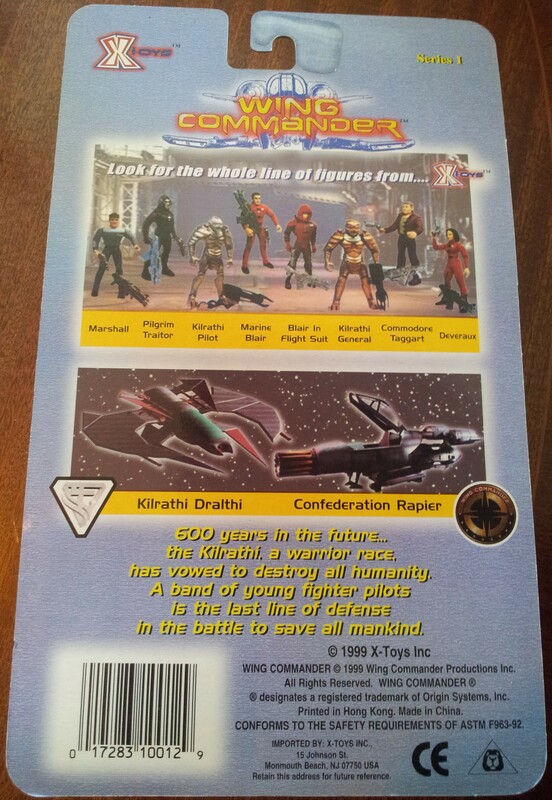 The titles show a very brief history of the Kilrathi war. The movie goes right back to the beginning and comes in more or less where the first game started although the plot is going to be very different. My first and possibly biggest complaint with the whole film is the music. The theme used here attempts to be epic and rousing but comes across as over the top to the extent that it would fit far better with a parody of the sci-fi genre. This is a bit of a problem as the same theme will be used constantly throughout the film. George Oldziey’s music in Wing Commander 3 and 4 was superb – this just isn’t on the same level and it makes it difficult right from the start to take this film seriously. The music at no time contributes towards generating an atmosphere which is vital in any film. …which is immediately attacked by the Kilrathi. The special effects here aren’t too bad although not brilliant by modern standards. The effects were done by a new company called Digital Anvil formed for this movie which would then go on to do work on Starlancer and Freelancer. The Kilrathi invade the command ship (called the Pegasus) and go for its NavCom unit. The self destruct on this fails and the last we see is a desperate message being sent by the Captain. This message is picked up by the Concordia which is under the command of Tolwyn (this time played by David Warner). The entire cast for this game has been changed from Wing Commander 3 and 4 which isn’t necessarily a bad thing provided you get the right people in. It is after all set many years earlier than the events in Wing Commander 3 so everyone is supposed to be a lot younger. We do see a few actors who were in Privateer 2 though including David Warner. Out of all the actors in the film he isn’t actually bad at all as Tolwyn but he is barely on screen and his character is quite different to the Tolwyn in the games. If the Kilrathi have the navcom they can find a route to Earth and be there in 40 hours. The Concordia can’t get there for 42. There is however a nearer civilian ship commanded by Taggart and crewed by Blair and Marshall. This is where we cut to Blair fiddling with a funny looking cross. You don’t find out for a while but this is a relic from his mother who from from a race of human explorers called Pilgrims. These Pilgrims have a mythical ability to feel their way through space and navigate without the need for Navcoms but they thought they were better than humans and were all but wiped out in a war with Terrans some years back. Blair is half-pilgrim on his mothers side but his father was a war hero. Both died when he was very young and he carries the cross for luck although it seems to bring him trouble. This idea of pilgrims is a new one for the movie and I’m not keen. I prefer my sci-fi without mythical extras on the whole – I guess we have Star Wars to blame for that but it was done far better in those films. Blair is played by Freddie Prinze Jr. I couldn’t honestly tell you another film he had been in. He isn’t too bad here given the material and his performance is best described as inoffensive. Blair and Marshall are called to the bridge by Taggart. Taggart appears to be played by a Frenchman (although I’m guessing). He definitely isn’t Scottish at any rate. We get the message and instructions from Tolwyn to attempt to go with a message to the Tiger Claw about what the Kilrathi are up to. Taggart knows a shortcut and leaves Marshall to fly us to it. The moment he’s left on his own, Marshall speeds up ignoring his orders. This isn’t a good idea as the reason no one uses this route is a mini black hole which we are now speeding towards. Taggart orders Blair to fly us through the jump point while he is fixing the ships systems and Blair miraculously does this faster than a NavCom even though he has never done it before. He does this in the manner of a hacker in a Hollywood movie – i.e. he types a load of random keys really quickly for a couple of seconds. This is his Pilgrim heritage at work. We get to see the Tiger Claw for the first time. Why the s was dropped from the name I don’t know. It doesn’t look much like the original either. There is a definitely WW2 thing going on with the ship design in this game with the cap-ships being submarines and the fighter’s WW2 planes. We arrive and hand over the disk to the ships captain. The captain is played by David Suchet who makes me think immediately of Poirot and definitely not of a ships captain. His second in command should be at home in a submarine as he is played by Jurghen Procnow who was the captain in Das Boot. He’s a decent actor and I especially liked him as the weary German army captain in The Keep but he has a one dimensional role in this film playing a racist anti-pilgrim antagonist who makes life difficult for Blair. Blair goes exploring the ship with Marshall and climb into a Rapier for the fun of it. He gets to meet Angel and annoy her first by sitting in a dead pilot’s (Bossman) ship and then by mistaking her for a technician. She isn’t French but has an English public school accent. The captain has a look at Tolwyns message. It tells him to proceed towards Earth and scout out what the Kilrathi are up to and if possible slow them down. Blair heads for the bar with Marshall who makes the point of introducing himself as the best pilot on the ship. Blair manages to annoy Hunter by mentioning that he sat in Bossman’s fighter. Apparently if someone dies around here they never existed…. Angel breaks it up but not before Hunter has pulled Blairs cross out exposing his heritage. The captain isn’t inclined to believe the orders but Taggart convinces him by giving him a ring which has been in Tolwyns family for 16 generations. Marshall and his new buddy Katie go out on patrol in the meanwhile. The fighters they are in look like a WW2 plane with short wings and no propeller. This is clearly deliberate and while you can make a case that WC was always about WW2 dogfighting in space, this literal interpretation just looks strange. Marshall pulls off a stunt on landing flying in upside down. Katie copies him and it lands them both in trouble with Angel but it does earn him his Maniac call-sign. The Tiger Claw arrives in system and Blair is sent out with Angel to scout ahead. They find wreckage from the Pegasus and also a Kilrathi listening satellite. Blair thinks the Kilrathi are onto Angel who is hiding behind a satellite so despite orders to avoid contact they engage and destroy all targets. This gives another opportunity for people to have a go at Blair accusing him of betraying them because he is a Pilgrim. He does at least manage to convince Angel that he is on her side. Maniac is getting friendly with his wingman when they are sent out to attack the Kilrathi. Taggart is sent along as well but was of the opinion from the start that it was a Kilrathi decoy and a mistake to go after the target. His suspicion’s are confirmed and he reveals himself to be an undercover Commodore and orders the wing back to defend the Tiger Claw. Taggart is correct and a fleet is attacking the Claw. … but the fighters arrive in time and Paladin takes down the Kilrathi cap-ship himself with a 4 torpedo attack run. Everyone is ordered back to base but Maniac + g/f head off to take out a few Kilrathi. This inevitably results in her ship being damaged and she crash lands on the Claw with no chance of surviving. Angel wants to execute him for treason but is talked out of it eventually. The Claw decides to hide in an asteroid from the main Kilrathi fleet. They send out a decoy to distract the Kilrathi but some of them still carry on and start bombing every crater. This whole scene plays out like hiding from the depth charges in Das Boot except of course its nowhere near as good. The ship is hit and suffers a hull breach. One of the pilots from Hunter’s squad is nearly sucked out but Maniac rescues him getting him a bit of redemption in the eyes of some of the crew. The Claw needs fuel so the next mission is to capture some from the Kilrathi. This means a bit of combat on a Kilrathi ship. It’s very brief and try as I might to capture a screenshot of the Kilrathi they are on so briefly that this is as good as I managed. Blair discovers the missing Navcom which means that they now know the location that the Kilrathi will be entering Earth space. Someone has to go to Earth and pass on these coordinates. Step forward Blair who is the only one who can do the job thanks to the quickest route being impossible to navigate by Navcom. He is sent with Angel to follow him but she gets her ship damaged by Kilrathi and he has to leave her behind for the sake of Earth in a scene that attempts to be touching but really isn’t. A Snakeir spots Blair enter the jump and follows. I get a decent screenshot of some Kilrathi at last. They look quite a bit different to those in the game although I was never entirely happy with the giant Muppet from WC4. These are if anything a bit of an improvement but I can see why they don’t get much screen time. Blair makes it to Sol and broadcasts his message but in the meanwhile the Tiger Claw is having to fight its way out of trouble. Tolwyn can’t give Blair any help as they have to cover the jump coordinates. Conveniently for Blair he is near the anomaly from the start of the movie and manages to sucker the Snakeir in too close. In one of the more improbable plot features it mistakes the black hole for the Confed fleet until its too late. Blair escapes but is now out of fuel. The Tiger Claw manages to survive its encounter and the rest of the Kilrathi get blown to bits within moments of coming through the jump point by the Confed fleet. Blair is picked up by a pilot looking suspiciously like Chris Roberts and rushes off back to base. Angel was found and picked up by Paladin and we get the obligatory “romantic” ending. 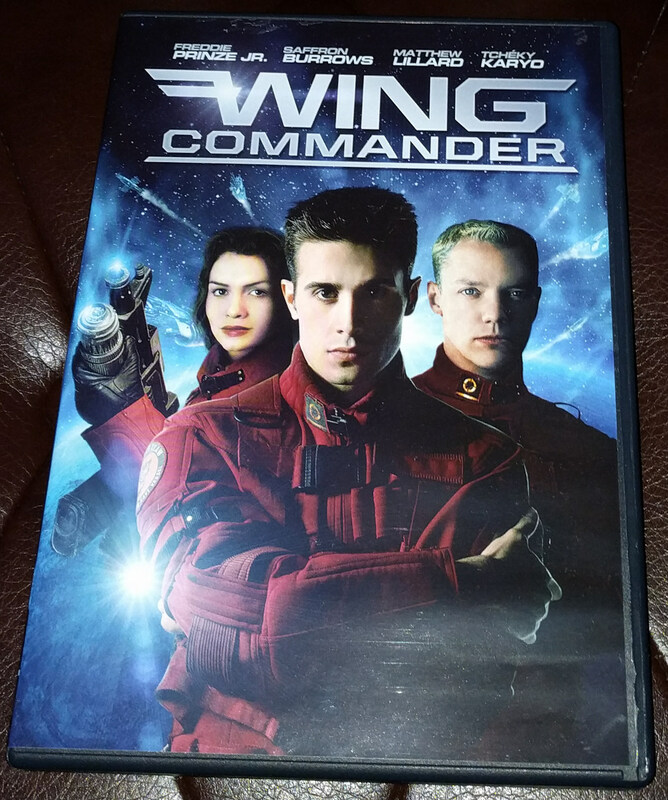 Wing Commander isn’t perhaps a bad movie but it certainly isn’t good. I can’t for instance point at any of the actors and say they were awful although some of the casting decisions were perhaps a bit odd. The real problem lies in its utter blandness. It flits between situations with little to no character development and fails utterly to generate any tension, excitement or interest in what happens to its cast. The film only lasts 90 minutes but it feels like a long, long time. By contrast if I start Wing Commander 4 it takes all day to play through and I find it all but impossible to drag myself away. The script is extremely weak. It borrows from various sources and ends up being so generic as to contain nothing but the barest hints of originality. What story there is, is rushed, poorly told and predictable. It’s hard not to point the finger at Chris Roberts as well and blame his direction. 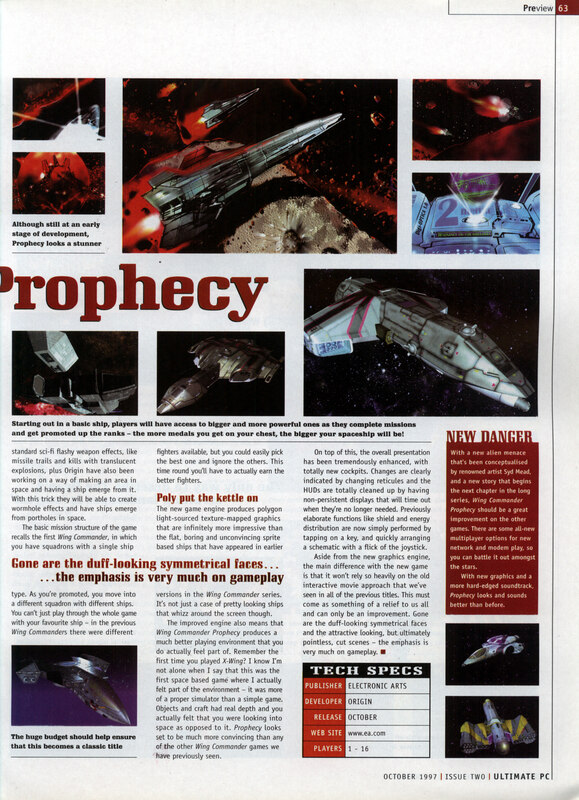 He had already shown a lot more ability than this in Wing Commander 4 but he had a very experienced cast to help out which may have made a difference. Chris Roberts blamed studio influence, however, and has said he would not have agreed to the project if he had known how it would turn out. Apart from names and places this has little in common with the Wing Commander I know – this sort of deviation from the original formula just annoys the fans who are always going to form your core audience. 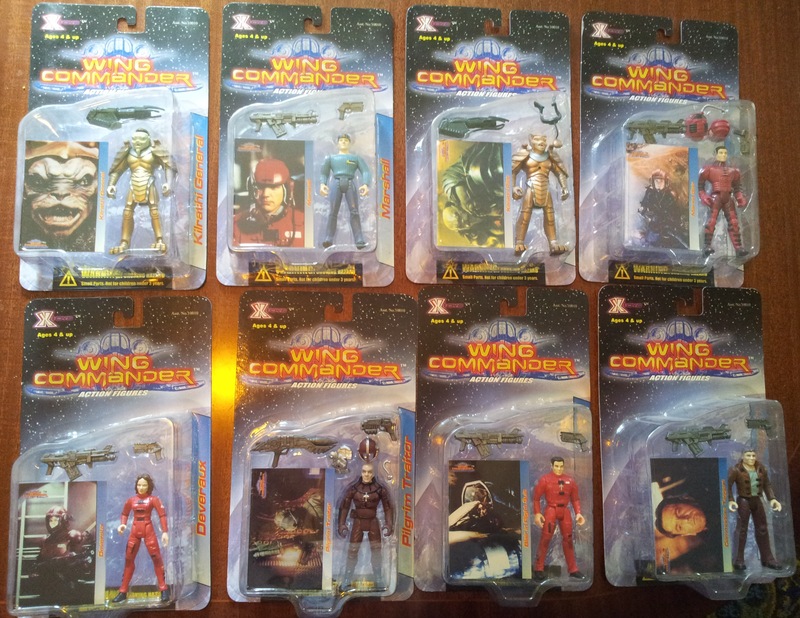 Personally I would have done a retelling of the story from Wing Commander 3 with the same core cast as in the game. This would have taken advantage of the franchise and most importantly got the WC fans onside right from the start. Like I said at the start Wing Commander isn’t a bad film, it’s just bland and extremely boring which is even worse. You can still get entertainment from a truly bad film. This film has nothing to offer whether you are a WC fan or new to the series. I honestly can’t think of a worse game adaptation than this and if that isn’t damning criticism I don’t know what is. I’m going to have a break before I start on the next game. It won’t be anything major – Lands of Lore is working in scummVM now on my PSP and I’d like to have a go at adding in a digital soundtrack to it before I start anything new here. I’ll easily get that done this weekend and should be back sometime next week.